As millions of Americans honor the service and sacrifices of veterans this Memorial Day, the FBI said it will be busy keeping a close eye out for reports of "frauds" who don fake medals and tell tales of false heroism in hopes of taking advantage of honest patriotism. While at any particular time the FBI is investigating from 15 to 30 cases of people illegally posing as American war heroes, the Bureau said public veteran celebrations, like the parades taking place across the nation today, are ripe targets for imposters. "Theyre going to come out of the woodwork," Don Shipley, a private watchdog and former U.S. Navy SEAL, told ABC News. "This is like Christmas for a phony." Wearing a service medal or claiming to be a medal winner is illegal under U.S. lawin most cases and in the past five years alone the Department of Justice has charged dozens of people for violations -- including five so far this year. In addition to FBI investigators, private veteran watchdogs like Shipley and Home of Heroesfounder Doug Sterner say they receive thousands of tips about questionable military service claims, especially on patriotic holidays. "We always see them come out in droves on Memorial Day, Veterans Day and the Fourth of July and I dont expect this year will be any different," Sterner said. Following the fame garnered by the U.S. Navy SEALs after the successful operation that killed Osama bin Laden in early May, the number of fake SEAL cases skyrocketed, Shipley said. While the FBI says many war hero impostors purchase replica medals, some people actually create non-existent medals, like those pictured here. "U.S. military medals are symbols of heroism, patriotism, and honor," the FBI said in a statement to ABC News. "The FBI is proud of the men and women who have served our country dutifully. Those who impersonate veterans or wear an unearned military medal are frauds and demean what the medals are meant to honor." Despite several convictions for fakers in past years, a group of U.S. congressmen is pushing to expand the law under a new version of the Stolen Valor Act, which would make it illegal for anyone to benefit in any way from lying about military medals -- from getting a free beer at a bar to season sports tickets. 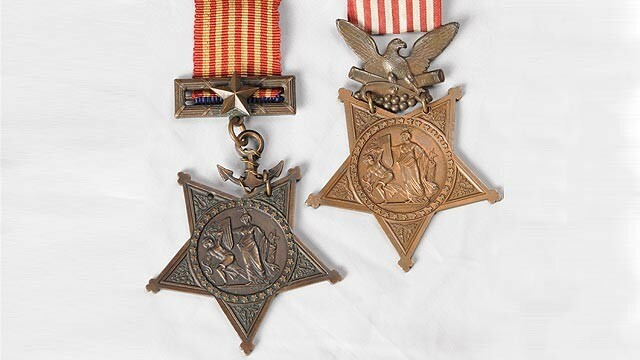 A previous iteration of the Stolen Valor Act, passed with overwhelming congressional support in 2006, made it illegal for anyone to wear a medal or claim they had been awarded a medal when they had not. However, that law was ruled unconstitutional by one appeals court last Augustafter one man who pleaded guilty to falsely claiming to be a decorated Marine said it violated the First Amendments guarantee of free speech. "What this bill would do is that it makes it more of an anti-fraud bill," said Congressman and U.S. Army Reserve Col. Joe Heck, who sponsors the Stolen Valor Act of 2011. "It says if you lie about your military service in order to gain something of value then you have committed fraud. I think it will close the constitutionality loophole that has caused problems for the original law. "I find it really deplorable that individuals would try and capitalize on other American service to their nation," he said. Shipley said he strongly supports Hecks bill and he believed other veterans would as well. "Theres got to be a line drawn somewhere," he said. "Not just for the young Army guys and young Marines, but the parents, the kids, the wives -- they [the imposters] are stealing honor from all these people."